PT. Eternal Buana Chemical Industries (“EBCI”), is the largest resin manufacturer in Indonesia. Its production facility is located in Tangerang, Banten. PT. Eterindo Nusa Graha (“ENG”) is one of the three plasticizer manufacturers in Indonesia. Its production facility is located in Gresik, East Java. PT. 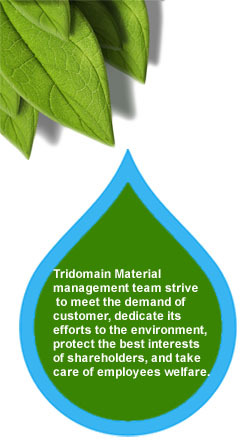 Tridomain Chemicals (“TDC”), is the only Acrylamide manufacturer in South East Asia. Its production facility is located in Merak, Banten. PT. Petronika (“PNK”) is one of the three plasticizer manufacturers in Indonesia. Its production facility is located in Gresik, East Java. TPM and its subsidiaries have over 30 years of track records in the industry. They have established strong relationship with their customers and suppliers in domestic and global market. This has made TPM into one of the most dominant player and market leader in its industry sector. TPM’s customers come from domestic and overseas. Most of TPM's overseas customers are domiciled in Asia Pacific, Middle east, Australia and New Zealand. TPM's expertise in specialty materials is supported by a strong in-house R&D team which enables the company to provide solutions for products and processes improvement in the infrastructure, construction, automotive, environmental and manufacturing industries. In the light of rising global population, rapid urbanization and increasing number of megacities, more and more of TPM’s products and services will be needed, both domestically and globally.